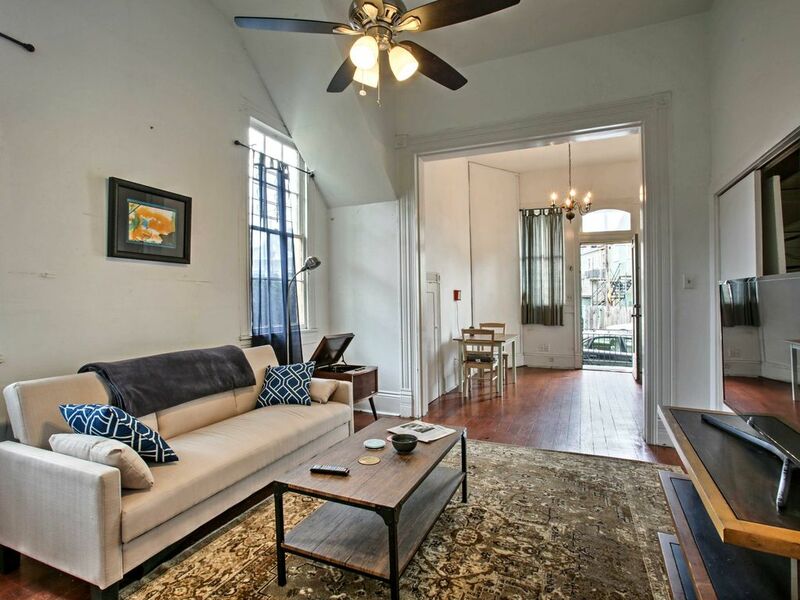 Let this charming vacation rental serve as your home-away-from-home during your next New Orleans holiday! Boasting 1 bedroom, 1 bathroom, modern appliances, and accommodations for 3 guests, this apartment has everything you need for optimal relaxation throughout your stay. Nestled in the Garden District, this unit is minutes from all the eclectic attractions of 'The Big Easy,' including live music, seasonal festivals, delectable cuisine, galleries, museums, and beautifully manicured parks. Designed to exude comfort, this historic 1870s property is highlighted by rich hardwood floors, soaring ceilings, ornate woodwork, and comfortable furnishings. Sprawl out on the plush sofa in the living area and enjoy leisurely evenings in front of the flat-screen cable TV. You'll want to put your culinary skills to the test in the well-equipped kitchen with modern appliances and a wine fridge. If you're in the mood for a barbecue, fire up the shared charcoal grill out in the backyard. Serve your home-cooked cuisine at the cozy table for 2 in the dining area. When your eyes start growing heavy, dive under the covers of the cloud-like queen bed and drift off to uninterrupted slumbers. This vacation rental is situated in the picturesque Garden District, perfect for scenic strolls through Coliseum Park and streets lined with historic homes. Make your way over to nearby Magazine Street speckled with boutiques, cozy cafes, and delectable eateries. Rent a blue bike from the station 30 yards in front of the home and cruise over to the enchanting French Quarter district featuring the St. Louis Cathedral, the French Market, Steamboat Natchez, boutiques, and so much more! Almost every weekend in New Orleans, there is a parade or festival lighting up the streets. Mardi Gras, Jazz Fest, and French Quarter Fest are just a few of the events hosted in The Big Easy. This home is just 2 blocks away from the Mardi Gras parade route, ensuring easy access to one of the biggest celebrations in Nola! Other area attractions include the Sydney & Walda Besthoff Sculpture Garden, New Orleans Museum of Art, D-day museum, Superdome, Canal Street and more - all just minutes from your front door! - Central New Orleans location - 1 block away from Coliseum Park, 2 blocks from Mardi Gras parade route and Magazine Street, and 1 mile from the French Quarter! Apartment is definitely old but it was clean and great for a weekend stay. The property manager was responsive and easy to communicate with. Location worked for us. 25-30min walk to bourbon st/French quarter or a 15min (depending traffic) lyft ride. Bunch of places in the area to eat at. Not sure I would recommend walking around at night in the area. Cozy house in a great location! My husband and I stayed at this cozy apartment during our 5 days in New Orleans and loved it. The location was perfect in that we were close to some great restaurants and the trolley on St. Charles (1 1/2 blocks), and a comfortable walk from the French Quarter (about 30 minutes). It is located just a few blocks from the WW II Museum, which was one of the highlights of our trip. While the building is an older home, it was very clean and we had everything we needed for a comfortable stay. We would definitely stay here again when we return to New Orleans in the future! Great place. Had everything we needed for our short getaway. Easy parking, well kept, short walking distance to everything. Had no problems at all. Perfection! We had a wonderful vacation stay and loved New Orleans. This rental place is in a great location and the perfect size for 2 adults. My husband and I were able to walk to several good restaurants and sites. Love that it was also so close to a nice little park where we could take a nice relaxing after dinner walk. Neighbors were quiet so it was a nice place to settle into for the evening after site seeing. I gave this a 4 star rating as this beautiful place does need some minor upkeep and fresh paint. Other than that, I would be happy to stay here again and to recommend to friends. Thank you for being part of a wonderful vacation!